Loveall News! : Happy Valentines Day! I hope you all enjoyed your Valentines Day with whom ever you spent it with! Matt and I went to dinner at Chick-fil-a (it was free) and then we walked around Babies R Us and did some registering. I guess that is how you spend Valentines Day on a budget. We had a great time enjoying each others company. This was our 9th v-day together! I love you honey! 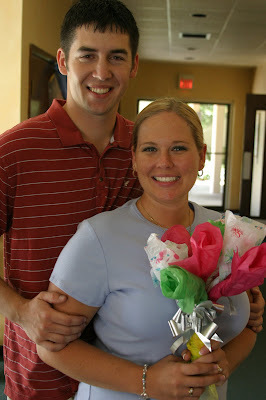 This picture was take almost 4 years ago at our wedding rehearsal.